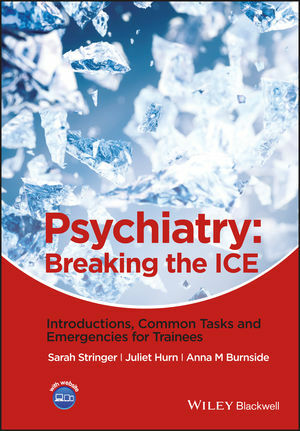 Psychiatry: Breaking the ICE contains everything psychiatry trainees need in order feel confident and competent in general adult inpatient and community placements. Dr Sarah Stringer, Extreme Psychiatry Course Lead; Honorary Lecturer, King's College London, London, UK. Dr Juliet Hurn, Consultant Psychiatrist, North-West Southwark Support & Recovery Team (Community team), South London & Maudsley NHS Foundation TrustNorth-West Southwark Support and Recover Team, London, UK. Dr Ann Burnside, Consultant Liaison Psychiatrist, West London Mental Health Trust, London, UK.